2018/2019 Scholarship was awarded to Brodie Falconer for guitar tuition, and the bursary was awarded to Carly Docherty for piano tuition. The program for 2018/2019 is now complete, we will announce applications for 2019/2020 in the spring. Click HERE to download a PDF of the Application Form for posting. SCHOLARSHIP: In order to apply for a scholarship you need to demonstrate at least two of the above criteria as well as meet the geographical and age restrictions outlined below. Your PMC tutor will supply an assessment sheet to the selection panel along with your completed application form. If you do not have a PMC tutor, then we ask that you obtain a reference from either your class music teacher or external music teacher to accompany your application form. BURSARY: In order to apply for a bursary you need to be from a household with an income lower than £26,000 per year and meet at least one of the other key criteria as well as meet the geographical and age restrictions outlined below. We also require a recording (in whatever format is easy for you to send) of the applicant playing, or talking about why they are applying for a bursary. • ONE FULL SCHOLARSHIP PACKAGE totaling 30 music lessons over the next academic year with a PMC tutor – providing £15 towards each lesson. • ONE BURSARY PACKAGE totaling 30 music lessons over the next academic year with a PMC tutor – providing £7.50 towards each lesson. NB: If the tutor charges more per lesson the recipient needs to make up the shortfall. Lessons can range between £15 and £25 per lesson. The selection panel will include representatives from local community organisations. The name of the applicant and any identifying information is removed to ensure the selection process is entirely anonymous. ELIGIBILITY: The scholarships and bursaries are for young people (8 to 25 years old inclusive – 5 to 25 years old for fiddle lessons), who meet some or all or our key criteria, and live in the Midlothian Council Region (postcodes can be confirmed here) or Humbie as part of the Tynewater Parish. To apply, please fill in an application form or email info@pathheadmusiccollective.org.uk to receive a form. NB We ask that the young person who is applying for the scholarship answers the questions on the application form wherever possible. The deadline for applications is 29th June 2018 (no applications can be accepted after this date), and the recipients will be notified by late July 2018. The scholarship and bursary lessons will start in the new school year in August 2018. Previous scholarship recipients are not permitted to apply for a new scholarship for the following 3 years, however previous scholarship and bursary recipients can apply for bursaries within the following 3 years. For online applications you will receive a receipt for your form. 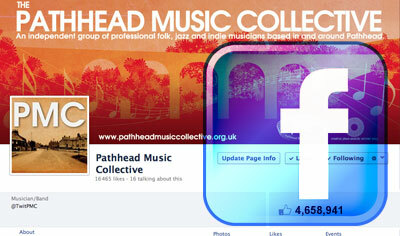 Please contact if us at info@pathheadmusiccollective.org.uk if you do not receive a receipt within 2 days of applying. The music tuition offered by the PMC tutors includes lessons in piano, voice, learning to sing in harmony, fiddle, guitar, bass, mandolin, drums and bodhran. We are currently looking for local business sponsors and donations from the wider community to help support this outstanding programme, and have various sponsorship packages, and a ‘Friends Of the PMC Scholarship and Bursary Programme’ being developed – for further info please contact info@pathheadmusiccollective.org.uk.